Customer loyalty is a key driver of profitable growth for businesses. The Net Promoter Score (NPS) is a globally recognized metric used by over two thirds of Fortune 1000 companies such as Apple, Sony and Amazon to measure their customer loyalty. Research on NPS methodology has proven that businesses who focus on building loyal relationships with their customers are more likely to retain customers and to be referred by those customers. 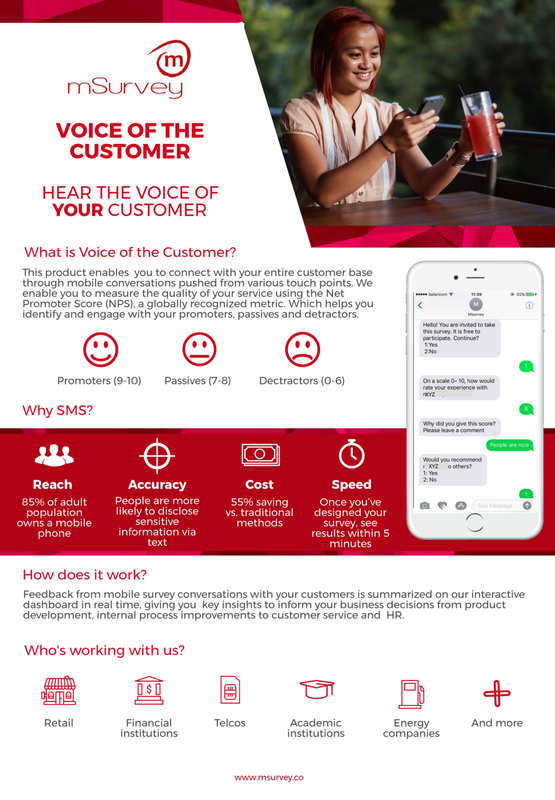 mSurvey is spearheading the adoption of NPS in Africa through one of our core products Voice of the Customer and unlocking revenue growth in the continent by enabling businesses to understand their customers starting from Kenya and eventually to the rest of Africa. To this end, mSurvey is launching Africa’s first ever Certified Customer Loyalty Masterclass on December 5th and 6th to re-imagine customer experience. With a focus on Heads of Customer Service, Heads of Research, Chief Marketing Officers and Business Analysts, the Masterclass will give participants a better understanding of NPS and how leading brands globally are building their customer experience to drive growth and how to apply NPS methodology on the African consumer. Richard Owen, co-creator of NPS, will be presenting on how to use the art and science of NPS to transform business. Richard is the co-founder and CEO of OWEN CX Group, an organization dedicated to helping corporations achieve success with their customer experience programs. Richard has enjoyed a 30 year career centered around the use of technology to transform business operations. He is a published author on NPS methodology and a seasoned corporate leader. He was previously a CEO at Satmetrix the cloud software co-creator of NPS. Prior to that he served in various executive positions at Dell Computer Corporation where he worked for 8 years where he oversaw the re-engineering of the companies supply chain operations.